Need a Newport News, VA Attic Insulation Company? As one of the biggest sources of energy loss in homes, attics are some of the best places to insulate. Does your attic have enough insulation? You may not know the answer, and that’s okay—many homeowners don’t. That’s where professional insulation contractors come in! If you need an attic insulation company in the Newport News, Virginia area, you’ve come to the right place. We serve the entire Newport News area, from Lee Hall to Brentwood to Colony Pines and more. We actually have a location here in Newport News, on Mueller Avenue! So how do you know if your attic has enough insulation? One easy way to tell if you need more attic insulation is by poking your head up there and looking around. If you can see your floor joists (if the insulation is level with or below them), you probably need more insulation. Whatever your situation, it’s a good idea to talk to a professional insulation company in the Newport News area. Attic insulation in warmer climates should include a radiant barrier, which is installed right underneath your roofline. It helps your home reflect, rather than absorb, heat from the sun. In the summer, this can make a huge difference—homes with radiant barrier can be up to 10 degrees cooler than homes without attic insulation! Radiant barrier, however, isn’t the only type of insulation that should be installed in the attic. Cellulose and/or fiberglass insulation should be installed in your attic in conjunction with the radiant barrier to be most effective. In addition to energy savings, insulating your attic offers a number of benefits. You can save a ton of money each year with the right amount of attic insulation—so although the upfront cost may seem like a lot, remember that insulation pays for itself in the long run. 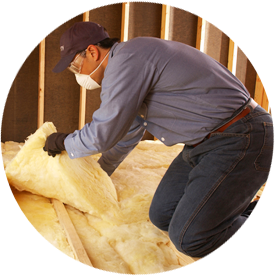 Need Insulation Contractors in Newport News, Virginia? If you want to install more attic insulation in your Newport News home, Tidewater Insulators is the only name you need to know! Contact us today if you want to learn more about our services or are ready to start your insulation installation project!